Okay, so absolutely none of that is true. In fact, it’s quite the opposite. I HATE conflict anywhere and most especially in the church. But it’s a fact of life that where people are involved, there WILL be conflict. This is just as true in the local church as it is anywhere else, and for those of us in ministry, learning how to constructively work through conflict that is sure to come is crucial. 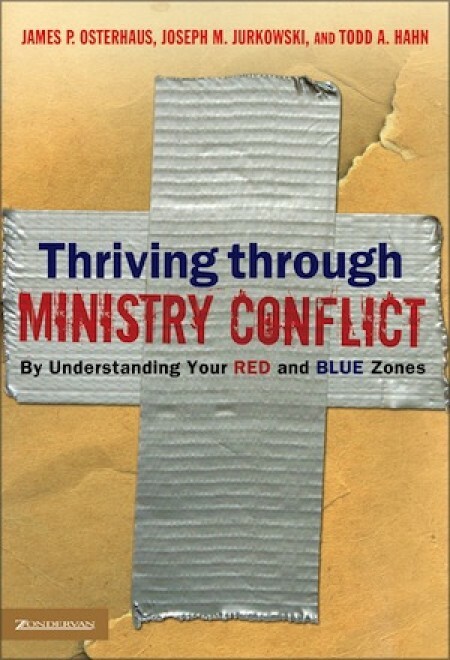 That’s where a book like Thriving Through Ministry Conflict: By Understanding Your Red and Blue Zones comes in. Written by a team of seasoned ministry veterans, this book is two parts — a fictional story about a pastor in conflict with his church and a section of reflective exercises to help real pastors determine how to best navigate their own ministry issues. The story revolves around Barry, a pastor who is just starting in his first pastorate. When he began his pastorate, he was told that the people wanted to grow to reach young families, and as he began implementing changes to achieve that end, he was met with opposition. After a meeting where everyone blew up in one another’s faces, Barry takes some time counseling with a man who has been there before and is able to see his own faults in the conflict, where expectations/realities were incongruent in the situation, and how to work in the “blue” zone, where goals are met in a respectful atmosphere instead of throwing a fit in the “red” zone where it’s all personal all the time. While not your typical fiction read (the text is heavy on explanations of management and conflict resolution), it was an entertaining read, and the exercises in the second half of the book were insightful and challenging. There’s a light bulb moment for Barry when he realizes that he can put an end to most of the conflict simply by uniting people under a common vision with a realistic plan to meet the goals of the church. That sounds really elementary, but in the midst of emotionally charged conflict, it can be difficult to make it happen. This book acts as a guide towards that end.